Welcome to the beautiful island of Thassos! Hotel Akti has recently been renovated and is a brand new hotel which offers stylish rooms in fresh vivid colours. 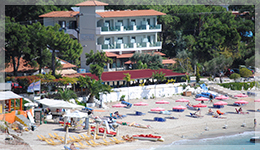 It is situated in Pefkari with the beach right at your doorstep. Its location is between two major tourist centres Potos 1km and Limenaria 3km. It is particularly very well looked after to fulfil every demanding customer's expectations. It consists of 24 modern and fully equipped units, a restaurant serving excellent quality meals and a cafe bar. Its picturesque beach is very well organised with beach umbrellas, sun beds, water sports and a scuba diving centre. Open from the middle of April until the end of October! We offer rooms, apartments, suites, as well as a beach house for our guests. Gentle sea-breezes, beautiful sunsets, and delicious meals all from your dining table. 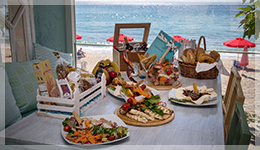 Pefkari is among the most beautiful beach resorts on Thassos.